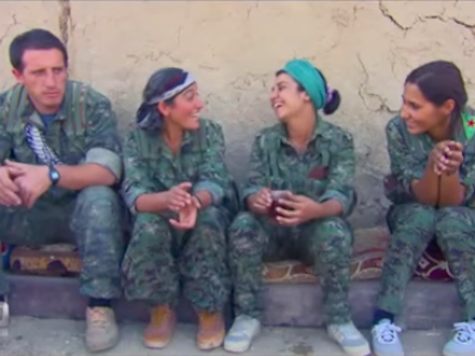 The women of the Kurdish People’s Protection Units (YPJ) fighting the Islamic State on the front lines in Iraq and Syria have a message for the rest of the world: ISIS is not just a threat to them, but “a threat to humanity.” 60 Minutes Australia embedded with YPJ forces in Iraq and Syria and found a tough-as-nails force willing to die to save the world from radical Islam. The YPJ have one significant advantage against their male counterparts, which has aided their success against jihadists: ISIS terrorists believe that they earn an eternity in Heaven and their own bevy of virgins upon dying in the name of Allah, but such privileges are revoked and they are condemned to shame, rather than awarded martyrdom, if they fall at the hands of a woman. The women fighting give Islamic State jihadists a weakness that greatly heightens their vulnerability: a fear of death. The women are exceptionally proud of their work. One English-speaking soldier, who tells Brown she once wanted to be an economist, notes that entering the war is a difficult life to follow, but a necessary one in her eyes. “All of us wanted to live a safe life, to go complete our studies and have boyfriends … but we live in an emergency situation,” she says. The report also includes footage of active battles between the YPJ and ISIS fighters–a real exchange in which Brown finds herself yards from jihadists on the attack. It is a fascinating report with one major oversight: Brown describes the YPJ as designated terrorists by the United States in the West; a different Kurdish group, the Marxist Kurdish Workers’ Party (PKK), has received that denomination, though the groups are associated.